The story in my trilogy had turned out to be strange, fascinating and shocking; born from an incident that happened to me a decade before. I knew then that writing fantasy was for me. My sister’s comment, saying my next books should have more guts to them; meaning gritty, set me on the road for my series of books. I’m a panster. All I have is a glimmer of an idea and find a title to keep people guessing as to why I’ve chosen it. The characters definitely choose me. It’s the only way to describe it and they tell the story. All their quirks are laid bare for the reader, and me, as I have no idea where each book is going from the off. It’s exciting. I cannot describe how much I love this new world I’ve stumbled into. Eighteen hour days are the norm for me and have been all my working life, but the diversity of jobs we have to master in the writing world, being an Indie author, is immense. Keeping all those plates spinning could get me a job in a circus, if I had the time. As each book is published, a bit more marketing encroaches on the time I’d like to be writing. The only way around it is to become more adept at all the other jobs attached to the craft, freeing precious time. When I’ve finished scheduling the promo for my books, I look at my clock and know that I have a good twelve hours to write. Deep into the small hours is my usual finishing time. From midnight, Twitter, where I promote my books and where I keep up with my readers, slows down. It’s the best time of day for me. Once I’ve written a large scene, I go back and write in all the intricacies in the story. It should come alive on the page and fill the reader’s mind so that they feel like a watcher inside the world I’ve created. If I spend a whole weekend on a few hundred words, it was well spent in my book – never begrudged. My characters are quirky. They aren’t completely human, either. A new breed and right bang in the middle of our lifetime; working for MI5 in the police force. Being totally dedicated to their jobs; dealing with the most gruesome serial murders that have become the norm, there’s a flip-side, and their extreme lifestyle where they let off steam is accepted by the powers-that-be. They make the most of every spare minute, be it with music, eroticism or just plain fun as they are on permanent call-out. No matter what they’re doing they drop everything for the job. Split Decisions Book 1 tells how the first two hybrids become a couple. Yes, I’d written some erotica in the trilogy but this was a different kettle of fish, entirely. The word extreme kept filling my head. They were outrageous in every other aspect of their lives, so why not in their love life? Now I was liberated. No constraints and the characters took me on a journey I never thought anyone would touch with a barge-pole. By the time I was on chapter fourteen I approached a publisher to see if I was writing rubbish, or come to that, would anyone print a book that was so shocking and explicit in every respect. They requested the full manuscript a few weeks after my submission of four chapters, and five weeks later I received the contract for my first book. I won’t go into detail about that year, apart from this: by the time book one was published I’d written the first four in the series. 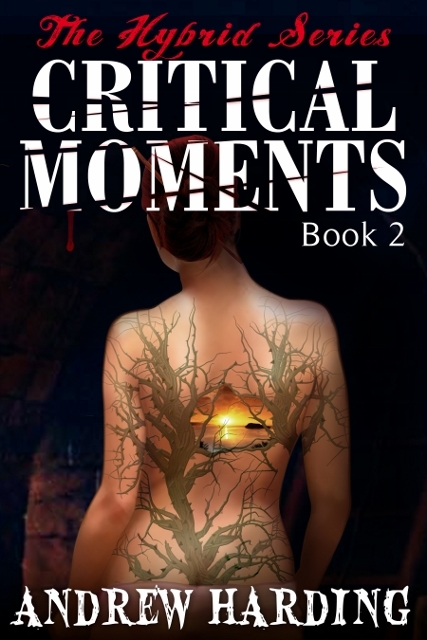 Critical Moments, book two, was published a month later. I hold copyright and published them as ebooks. My publishing experience put me through the worst year of my life and I don’t say that lightly. 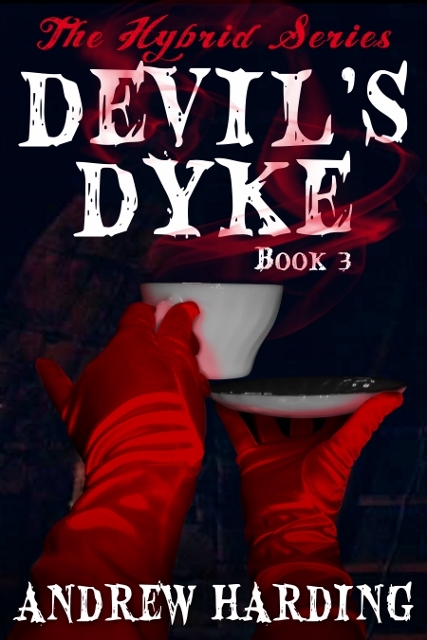 The other three titles in the series: Devil’s Dyke, Wet Daddy and Medium Rare are published as ebooks. I’m currently writing #6 Dydimus. The series is seriously graphic, so be prepared to be shocked. Each book has a unique crime although the back-story runs across the series. You’ll see the cell of hybrids grow, breaking new ground in the police force, as well as witnessing their totally outrageous lifestyle. My pleasure! Great info and fabulous cover art! Wish you all the best! The cover guy is brilliant, no other words will do for the wonderful covers he’s done for me. I think it covered most things; I could have gone on. Thanks Cynthia! Thanks Sandra and had to laugh at you still calling me Mr Harding. I know you’ve enjoyed the books and thanks for telling all your workmates! Quite a reading group there! Andrew is s very close friend of mine. I highly recommend any of his work. WOW what a great guy. Thank you, Pauly! I’ve seen your tweets pushing my work and here I can thank you properly and you can’t say you’re busy! Got you! Andrew Harding is a master at drawing you into his stories. His is a raw talent. And he’s an awesome guy to boot! I’m so proud to know him! Continued success Andrew! Thanks for your comment Minnie and great to see you here today! You’ve been an awesome friend to me too and I will get your blog written, promise! Fabulous writer and series! His characters are so very “real”, so exotic and so addictive, I can’t stop reading them! A true delight! Thanks for the glowing comment! You’ve always promoted me on twitter and I truly appreciate it Pucci! Chuffed you love the books and don’t forget you had a hand in the online book idea, I’ll never forget your input on it. Boy, did we have a laugh that day!! !